Earlier this week I received my copy of Ted Rosvall's updated edition of Bernadotteättlingar (The Bernadotte Descendants). I have really looked forward to this book, as it is a valuable addition to my genealogy library, and is a "must buy" for anyone with a serious interest in royal genealogy. It will be the standard work on Bernadotte genealogy for years to come. I have helped out with some information for the book and I am also mentioned in the book's preface, so this will not be an ordinary book review, rather a book presentation with some added comments. The first edition of Bernadotteättlingar was published in 1992. The new edition is an expanded version published in A4 format and is richly illustrated. The language is Swedish and English. Ted Rosvall has not only listed all the known descendants of King Carl XIV (III) Johan of Sweden and Norway, but has also tried to include genealogical information about the parents and grandparents of all the people who have married into the Bernadotte family as well as ancestry tables (so-called Seize Quartiers) of selected consorts to various Bernadotte descendants, including the ancestors of Prince Daniel (Prince Olof Daniel Westling Bernadotte). The updated information in this book is quite impressive, as even the marriage of Prince Nicholaos of Greece and Denmark and Tatiana Blatnik on 25 August 2010 has found its rightful place in the book! 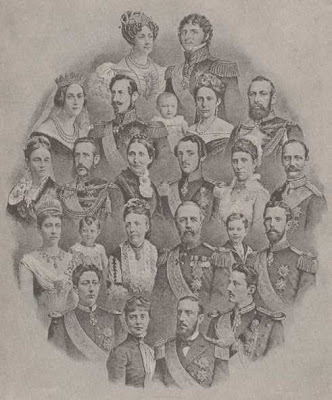 Getting all the information about the reigning and former reigning royal and princely families can be challenging enough, but even more impressive is all the details about all the commoners who descend from the Bernadotte royal family. It is wonderful to read about the Rydings, the Nilerts and the Duysans to mention a few examples. Rosvall has also included details about the newly discovered illegitimate branch of the Bernadottes, i.e. Count Folke Bernadotte af Wisborg's daughter Jeanne by the actress Lillie Ericson. The story was originally published in the Swedish magazine Fokus on 12 September 2008. Folke Bernadotte acknowledged the paternity among others when he approved the adoption of Jennie by the Norwegian-born Carl Matthiessen in 1926. There are of course many stories about Bernadotte kings and other descendants having children out of wedlock. Ted Rosvall would have had an impossible task if all the stories about King Carl XV (IV)'s nightly activities during visits to Norway had been proven to be true! Staffan Skott in his book Alla dessa Bernadotter (1996) mentions several children King Oscar II is claimed to have fathered by other women than his wife. But evidence is the key word here. You cannot list illegitimate descendants in a book such as this if the child has not been acknowledged by the father or without other evidence to back up the claim. Knowing from my own experiene with publishing genealogy, it is impossible not to make mistakes in a large work like Bernadotteättlingar. For instance is the surname of Princess Astrid, Mrs. Ferner's former son-in-law Tom Folke Beckman spelt with one 'n', not two. I am not going to dwell on this, as the few mistakes are minor details. The most important thing is that the book is here! A great source of information about the Bernadottes! However, I find it a bit annoying that I might be indirectly responsible for the mistake about the year Crown Princess Mette-Marit's parents Sven Høiby and Marit Tjessem married. It was in 1959, not 1958. I used Anette Gilje's book Sven O. Høiby. Et portrett (2007) as a starting point for my research. The author writes that Sven was 21 when he got married (he was born on 14 November 1936). Chapter 3 in the said book is also named Familieliv og arbeidskarriere (1958-1981) ("Family life and working career (1958-1981)"). I spent quite some time at the National Library in Oslo going through Stavanger Aftenblad on microfilm, but obviously I was checking the wrong year. I learnt too late that Mette-Marit's oldest brother Espen Bjarte Høiby was born on 17 August 1959, which would have given me a clue about which period I should have concentrated on (I knew the birth year, but not the date). Anyway, the information from Marit Tjessem came too late to be included in in the book. She and Sven Høiby married at Sola kirke (church) on Friday 20 March 1959. Conclusion: Go and buy the book! See also my earlier blog article about Bernadotteättlingar. The book costs SEK 295 + P&P and can be ordered from Rosvall Royal Books by contacting Ted Rosvall at royalbooks [at] telia.com. The website of RRB is http://rosvallroyalbooks.wordpress.com/, which will hopefully be updated soon. 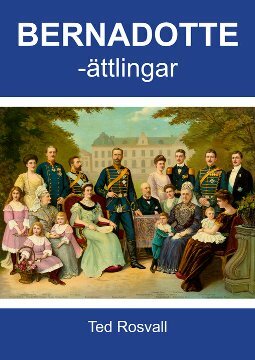 Members of the genealogical societies DIS Norge and Norsk Slektshistorisk Forening can buy the book for NOK 250 + P&P. You can find more information about how to purchase the book here. The Bernadotte family, 1888. See my website to learn who is who in the picture above. Updated on Sunday 12 September 2010 at 22.15 (typo corrected); Thursday 28 October 2010 at 15.20 (another typo corrected). Hello, I'm looking for information about one Albert Oberg/Arberg b. 1865 Sweden. He told his grandchildren that had be born as an illegitimate son of a Swedish prince. He named his own son Carl, who in turn named his son Carl as well. Perhaps there was a particular mistress around 1864 that Oscar 2 would have been known to have fathered a son by in 1865. I am curious about Oscar as I believe he appeared to me when I was 8 years old outside me window.